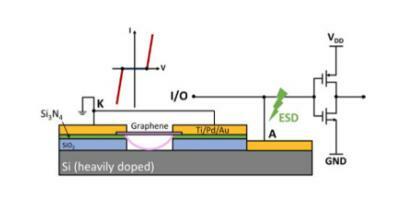 Engineers from the UCLA have Used graphene to design a new type of photodetector that can work with more types of light than its current state-of-the-art counterparts. The device also has superior sensing and imaging capabilities. 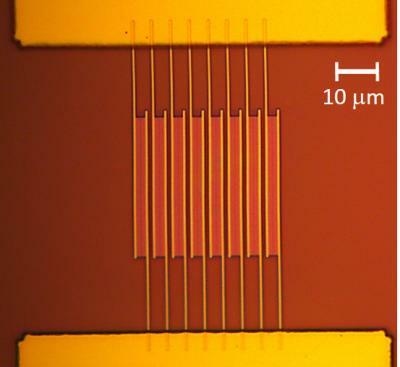 photodetectors' versatility and usefulness depend largely on three factors: their operating speed, their sensitivity to lower levels of light, and how much of the spectrum they can sense. Typically, when engineers have improved a photodetector’s capabilities in any one of those areas, at least one of the two other capabilities has been diminished. The photodetector designed by the UCLA team has major improvements in all three areas – it operates across a broad range of light, processes images more quickly and is more sensitive to low levels of light than current technology. A team of international researchers has made a graphene-based device that captures the real-time dynamics of a classic chemical reaction at the single molecule level. Developed at Peking University, UCLA and the Institute Chinese Academy of Sciences, the method could shed light on the mechanism of chemical and biological processes. 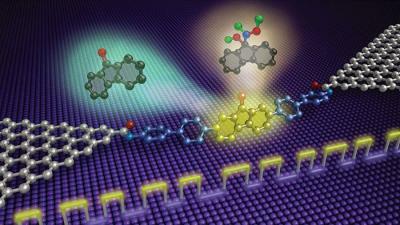 The device consists of two graphene arrays that flank a single molecule covalently tied to each array through amide linkers. The molecule, 9-fluorenone, contains a carbonyl group situated astride three fused rings. The team submerged the device in a solution containing a catalyst and the reagent hydroxylamine, which reacts with 9-fluorenone’s carbonyl group. The reaction changes the electrical charge of 9-fluorenone, so the team could follow the nucleophilic addition reaction by monitoring current conducted by the graphene arrays. Researchers from UCLA and the University of Connecticut have designed a biological supercapacitor which operates using ions derived from bodily fluids. The team predicts that this work could lead to longer-lasting cardiac pacemakers and other implantable medical devices. The biosupercapacitor, which features graphene layered with modified human proteins as an electrode, could be used in next-generation implantable devices to speed bone growth, promote healing or stimulate the brain.